Healthy eating at home is a doddle. There’s endless recipe ideas for delicious, nutritious, energy-rich meals by nutritionists, celebrity chefs and Internet bloggers. These days, dieting is more about carefully choosing your food, rather than cutting down on your food. Eating out, however, is a whole new kettle of fish. Restaurant chefs are notorious for adding lashings of cream, butter, salt, sugar and other yummy but fattening products to their sauces and salad dressings. Restaurant food may taste fantastic but not knowing what you’re eating is dangerous territory for a dieter. And it’s not just the ingredients we need to worry about either – gastro-pubs in particular seem to think they’re feeding small armies with their mountains of deep-fried chips on tray-sized plates. Most restaurants post their menus online. Check out the website and have a browse so you know what you’re going to get before you go. This will lower the risk of you impulsively choosing something unhealthy because you fancy it at the time. We’ve all been there – a friend orders something delicious-sounding from the menu and suddenly we feel less guilty about opting for that four-cheese pizza. If you go first then you’ve less chance of being swayed by your fellow diners. No one wants to be the awkward diner who holds up the everyone else’s orders because they want to customise every aspect of their meal. Unfortunately, being on a healthy diet means it’s necessary to know what you are eating. For example, if you order a salad, ask if you can swap the cream dressing for bottles of olive oil, balsamic vinegar and lemon juice. You can even ask if they have low-fat versions of normal meals like pizza and certain meat dishes. It’s better to be fussy than unintentionally unhealthy! 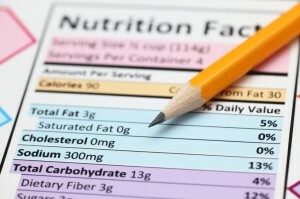 If you know the basic nutrition rules, the decision making becomes much easier. You’ll soon realise that eating healthily doesn’t have to mean going hungry. For example, if you choose meats like chicken and turkey over beef and lamb, you’ll be able to eat the same amount with less of the fat. To find out more about the health benefits of certain foods, please visit our Balanced Diet page. Pudding is, of course, the best part of the meal – the thought of sitting empty handed amongst a table full of people tucking into rich chocolate mousses and five-layer sundaes is seriously disheartening. Don’t forgo pudding, instead, opt for light options like fruit salad and sorbet. If you really can’t bear to leave the restaurant without trying an opulent dessert, find someone at your table to share with, or simply ask someone for a spoonful of theirs. This way you get the taste without the quantity. Alcohol: it’s the hidden culprit and probably one of the main reasons some dieters try hard to lose weight with few visible results. The fact is, we often deny our drinking habits, and this can be detrimental for a healthy diet. Opt for clear spirits and low-calorie soft drinks like soda water. Even better – do away with alcohol altogether and stick with a tasty fruit juice with sparkling water. Find the original article at Today Health. Weaning - When? Why? How? The Autumn Equinox – Time for a detox?